Efficient, affordable home cooling. Quality installation you can count on. Quiet operation: Engineered air discharge and high-efficiency fan motor for lower sound level system performance. For long lasting durability, the heavy duty fan motor is completely protected from rain and snow and requires no maintenance. High-performance compressor: Reliable, energy-efficient scroll compressor technology for quieter operation. Micro-Channel coil: All-aluminum Micro-Channel coil for greater corrosion resistance, maximum air flow and efficient heat transfer (most models). Built strong: Designed using galvanized steel with a polyester urethane coat finish. A 950 hour salt spray test shows the finish resists corrosion 50% better than comparable units. Solid protection: Complete metal wrapper protects the internal components from yard hazards and extreme weather. Attractive, classic dark gray styling with contrasting wire discharge grille for premium product appearance. Environmentally friendly: Uses EPA approved environmentally sound R-410A refrigerant. Efficiency performance can improve up to 14 SEER with a matched energy-efficient air handler or furnace with coil. 14 SEER energy efficiency is up to 8 percent more efficient than a standard model. Meets ENERGY STAR requirements in certain matches. Performance can increase up to 15 SEER or more when installed with a matched energy efficient indoor air handler or furnace with coil. 16 SEER energy efficiency offers exceptional performance, saving more energy, lowering utility bills. When combined with certain Airtemp engineered coils or air handlers, these models meet ENERGY STAR requirements. Rock-solid warranty coverage to protect your investment. 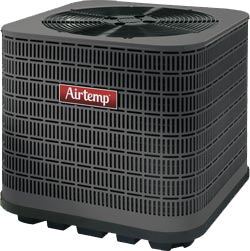 When you choose Airtemp for your home comfort, your system comes with one of the best warranties in the business - 10 years on all parts. Timely registration is required. Outstanding Airtemp products are worthy of outstanding protection. Should major component failure ever occur within the first year of operation, we will replace the product. Timely registration is required.